How to keep your family informed about your financial details? When there is no knowledge of money, they are likely to live a hand-to-mouth existence or rely on other parties for financial help. This essentially means all the efforts their husbands took in saving, investing and planning the family’s financial security went for a complete toss. So, ensure your family does not fall into the same trap. Make sure to keep them informed about your financial decisions so they can continue to live a life of comfort, security and happiness, even when you are not around. And most importantly, give details about the money you borrowed or loaned out. Otherwise, how would they ever know about the liabilities. Their ignorance could be taken advantage of! And then there’s the problem of communicating your financial records in the right manner. You or your parents may feel that recording information in an excel sheet is a good idea, but there could be big problems down the line. The laptop or back-up disk could become faulty or outdated, the passwords for your online storage files may get misplaced, etc. Most importantly, however, the information you record needs to be up to date, and expecting one to remember to do that regularly can be unrealistic. So, this means the onus is on you to not only write down your information, but also do it right. If you are wondering how you can inform your partner or family about your financial plans, here’s a simple solution: The iCare Booklet. iCare is a social initiative by Aegon Life Insurance Company that allows you to share your personal, financial and insurance-related details with your family by storing them digitally in one place which can be regularly updated. 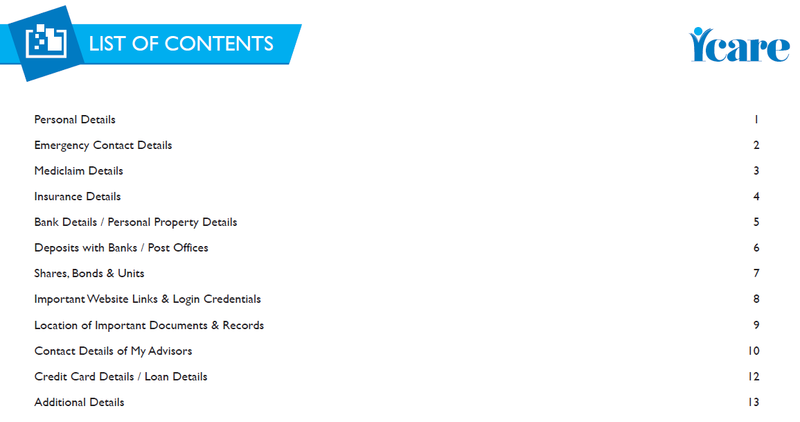 The ‘iCare Booklet’ maintains your personal and financial details in one place. You can update and share the same with the person who should have access to this booklet, be it your spouse or child or parent. That person, and only that person, will have access to the information. Not even Aegon Life. This way, what’s personal and important remains that way. Think of the iCare Booklet as an editable document. It saves you the complicated hassle of creating an excel spreadsheet. The booklet format is also more reliable when it comes to updating information or making some changes. You don’t want to be caught up in a bind! The iCare booklet stores information about your insurance policies and investments. This way, the iCare booklet can be a solid buffer to any duress that may arise later. It can sort all financial processes. How do you share the details with your family? Simply update the editable PDF file and share the same with your family, say via email. That is not all. You can also add important website links and login credentials. Do ensure you include the contact details of advisors, and the details of credit cards and loans as well. It is not just what you do but also how you do it. The same goes for the iCare Booklet. Make sure to update your iCare Booklet at regular intervals. This will help you keep everything in order. Save the document and give your family members access to it. They could use it in an emergency. Otherwise, they might not have all the information they need. So, sit down with your family and talk about your financial plans today. This will ease your financial worries and provide security to your family. And they too will not feel completely at sea. “I never thought about this earlier. Then Aegon Life made me realise I should document all vital information in one place. This would be for my family’s convenience after me,” says Shyam Kumar, who used the iCare Booklet earlier this year. “This is a very good initiative by the company,” says Jayprakash Reddy, another user. “I’ve shared this document with everyone in my network. I am sure it will be helpful for many,” he adds.